What is self-driving car? Among the general public, there is no clear conception of what a self-driving car is. Within the vehicle industry there are 6 levels that define how self-driving a vehicle is. Level 0, no automation: The driver is in control of the vehicle’s forward motion. Level 1, driver assistance: The driver is in complete control of the vehicle’s forward motion, but can utilise certain assistive functions such as ABS and Cruise Control. Level 2, partial automation: At this level the driver can hand over control of the vehicle to the car’s system in well selected scenarios, parking assistance for example. The driver is still responsible for taking over control in critical situations. Level 3, conditional automation: The driver can allow the vehicle’s system to take over all safety critical elements, but the driv­er’s attention is still necessary. Level 4, high automation: At this level the system can determine itself when it is safe to take over control of the vehicle and then do so. The system is not able to handle all dynamic situations that can arise, it then hands over control to the driver. Level 5, full automation: Requires no interaction with the driver in any situation. Today the majority of vehicle manufacturers have levels 1, 2 and 3 technology on the market. But the higher levels are not far away, Tesla, for example, has already launched self-driving ve­hicles at level 4. Most other vehicle manufacturers are aiming to offer level 4 vehicles between 2020 and 2025 and be able to offer vehicles at level 5 from 2025. The sensor systems that are needed to achieve self-driving cars are usually divided into three main groups: camera, radar and lidar based systems. Both camera and radar systems are currently used on cars for levels 1 and 2. Sub-components in these systems are also sufficiently advanced to be used for the higher levels. What is elegant about this is that it can be utilised to collect data to be analysed for the next level’s autonomous functions. 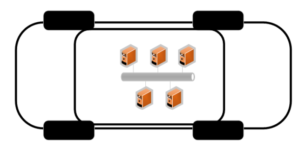 The vehicle’s current components, which are usually connected in one or a number of CAN networks, will be supplemented by a completely new layer of components and networks which will replace the driver and the driver’s choice of actions in different situations that can arise when driving. The difference in number of sensors and processing power will increase markedly with each stage of automation. 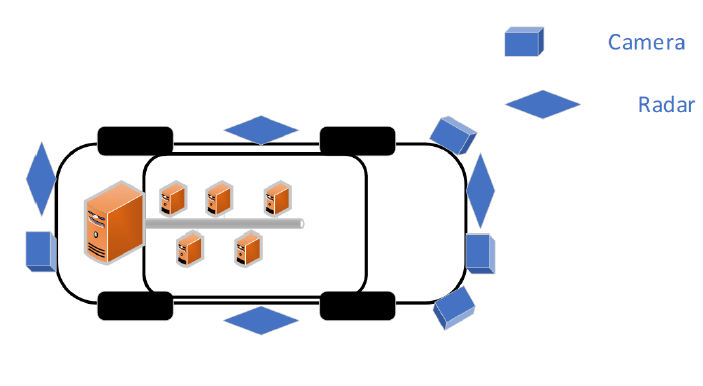 The traditional network with relatively simple computers is designed to manage the vehicle’s transducers and sensors. All interaction with the surroundings requires a driver. Replacing the driver in certain or all situations will require a sharp increase in new components and computing power. 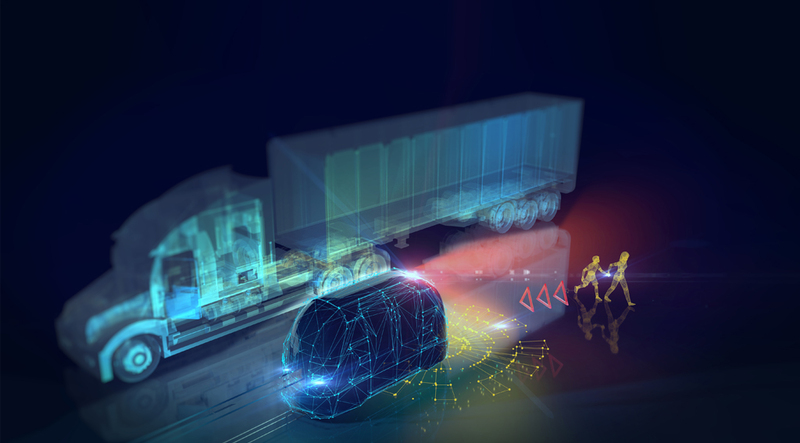 A camera and radar system generates a relatively large amount of data which has to be analysed in real time together with data from the vehicle’s traditional systems. To analyse camera and radar information, today’s distributed computers must be supplemented with computers with advanced processors and greater memory capacity. The CAN bus does not have the capacity to handle the quantities of data, rather it is necessary to introduce elements such as an Ethernet. Similarly, logging of vehicle data must be developed. Traditionally the vehicle industry has logged CAN communication since it was introduced. The quantities of data have gradually increased from the first logging of J1935 at 1 Hz which requires relatively low memory capacity to logging of CCP/XCP with up to 1 kHz where the memory requirement has increased to at least Gbyte level. The next step is the introduction of logging equipment, partly with traditional CAN connections,as well as with both Ethernet and analogue inputs for film and radar logging. 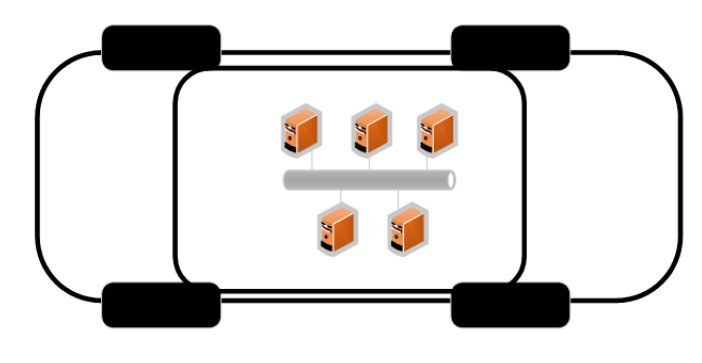 Logging of image and radar data drastically increases the requirement for memory management. It is not just the actual size of the memory that has to be taken into account. The memory’s capacity to store and upload in the shortest possible time is of major importance. To facilitate management of film and radar sequences, preprepared formats can be used for storage instead of logging the analogue flows. It will also facilitate time stamping of events that are logged where, for example, an alarm signal on the CAN bus can be analysed together with a film sequence. The major challenge will be to analyse all data that is logged and to use data from logging effectively in, for example, simulations in the lab for future autonomous functions. A prerequisite to raise the level of automation, with all the attendant complexity, is to have and be able to analyse data collected. The data consists of a multitude of different situations and types of data collected from the vehicle, the surroundings and driver interaction or AI. 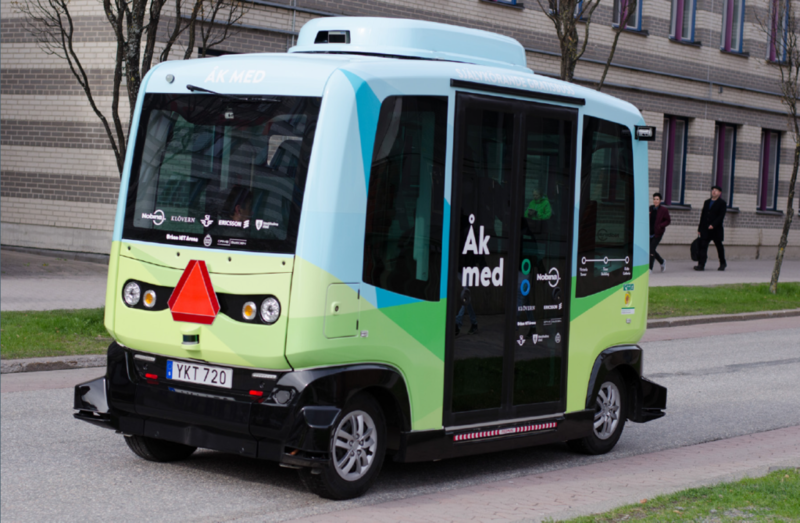 As several of the sensors that are needed for full autonomy are already fitted in vehicles with a lower level, it is a perfect situation to start logging data from all systems involved and from the driver’s actions. Imagine a vehicle of level 3 type and that the radar system produces an emergency braking call but the driver simply releases the accelerator. The film that has been recorded shows that there was a large black bin bag on the roadway. Using data collected from all components will subsequently enable models to be developed so that the camera can determine what type of obstacle it is seeing. Recorded data can also be used for feedback to functions under development in simulated environments, regression testing etc. Environments within the Automotive field always place high requirements on environmental endurance. Combined with several interfaces, a high memory capacity and frequently a lack of space in the test object, this makes specifying and developing general log equipment complicated. All vehicle manufacturers have their own strategy to construct solutions to log automatic functions. At Data Respons/Sylog, we have long experience of both data logging and the vehicle industry. Together with customers, we are looking at different solutions to help them raise automation to the next and subsequent levels. Sylog would love to hear from you!